If you’re feeling the chill this winter you’ll love my new winter warmer breakfast ‘hash.’ With just four key ingredients this recipe is easy to make, budget friendly, and soooooo delicious. You might ask ‘why add the beetroot?’ Surprisingly it pairs really well with the bacon and sweet potato. Plus I specifically wanted to use root vegetables as they have a warming effect on the body. Perfect for the cooler months. Also, as root vegetables grow beneath the surface, they energetically have a way of grounding us. Helping us feel like we have two feet firmly planted on the ground. Double whammy! I recommend you make a double batch so that you can warm up left over hash during the mid week rush. How to serve? Eat as it is, or bulk it up by grabbing a bowl, add some fresh greens, then some hash and top with a fried egg. So good when the egg yolk oozes down the sides. Simple, healthy and delicious, this meal gives you a big hug back! Share the post "Winter Warmer Breakfast Hash"
Preheat the oven to 200C and line a baking tray (to save on scrubbing). Pop the sweet potato and beets onto the tray and drizzle with the melted coconut oil. Generously sprinkle over salt and pepper and with your hands coat the vegetables with the oil. Place in the oven for about 30 minutes or until soft enough to eat. In a frying pan over medium heat, cook up the bacon until crispy and then add the onions and cook until caramelized. 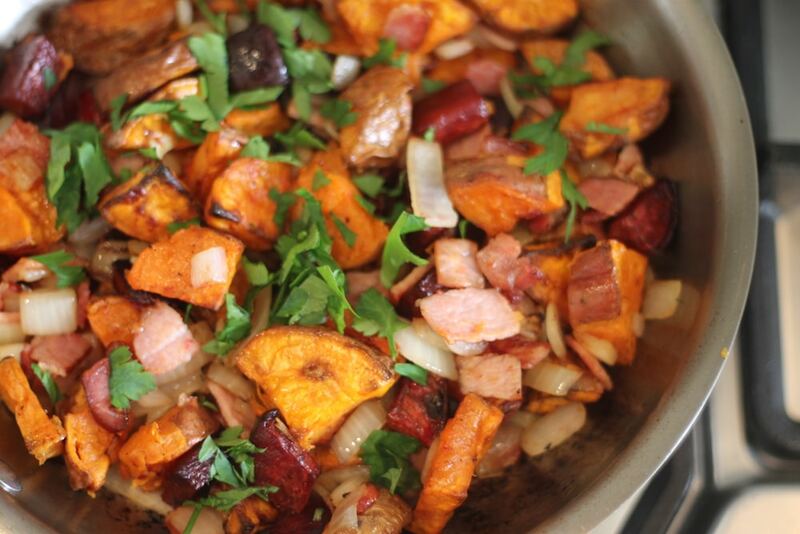 Add the sweet potato and beets to the pan with the bacon and onions, and stir for another 5 minutes, so the flavours combine. Sprinkle over some freshly chopped parsley and serve.